Tucked between Mount Wellington and the River Derwent, 12 miles (20km) upstream of the river mouth, Hobart is the capital of Tasmania, and boasts one of the world's most secure deep-water harbours. 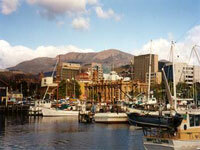 Hobart was established in 1804 and is saturated in colonial history. It is a sleepy, charming city and a great travel hub for Tasmanian adventures. The main historical district, Battery Point, is characterised by colonial stone cottages, tearooms, antique shops, restaurants and pubs. The Narryna Van Diemen's Land Folk Museum at Battery Point depicts 19th-century pioneer life. Here one also finds the Maritime Museum of Tasmania. Like most Australian cities Hobart has plenty of green lungs: the largest is the Royal Tasmanian Botanical Gardens, which is known for English-style plantings and trees, and a Japanese garden dominated by a miniature Mount Fuji. Other amusements for visitors include steam locomotive rides, guided tours of a former women's prison, tours of the Cascade Brewery, gaming at Australia's first legal casino at Wrest Point, taking a cruise of the harbour, or sampling the delights of the fudge factory at Island Produce Tasmania. Mount Wellington, which is a 13-mile (22km) drive from the city, offers extensive views across alpine shrubs and the city below.